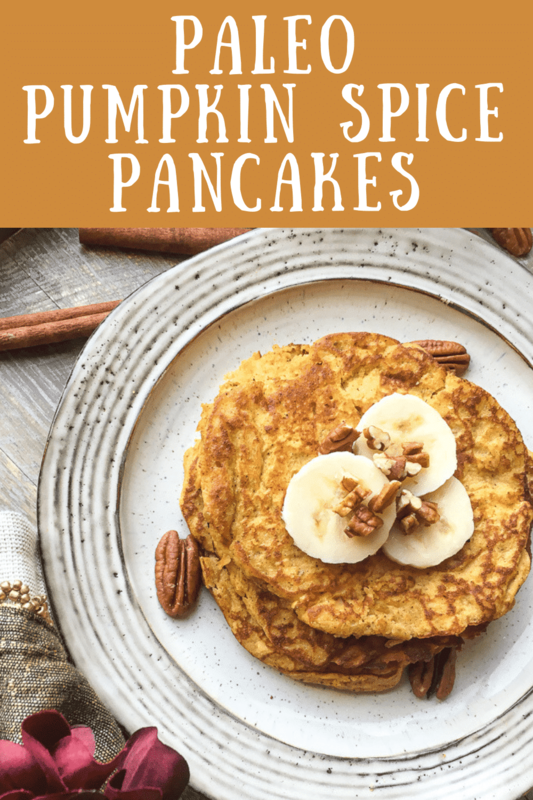 This recipe for Paleo Pumpkin Spice Pancakes will make your breakfast choice easy, delicious and healthy. It seems as though more and more people are choosing to get healthy and keep a closer eye on what they eat on a daily basis. Many are turning to the popular Paleo diet. Perhaps you or a family member fall into this category and are wondering how you will survive through the holidays with all the sugar- and fat-laden foods that abound at this time of year. 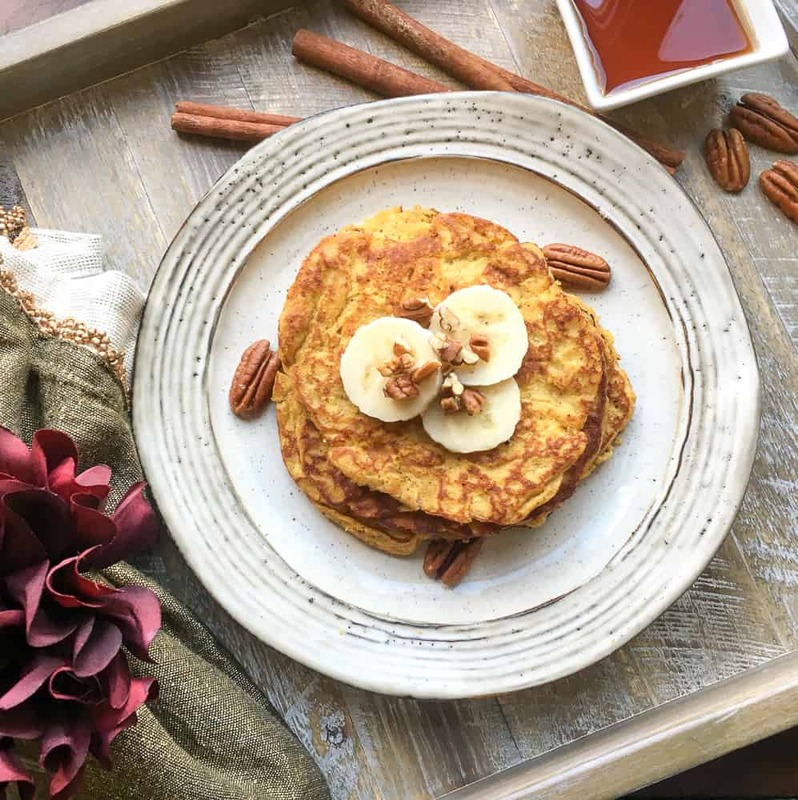 Made with honey instead of sugar, almond flour and coconut flour, Paleo Pumpkin Spice Pancakes are just the thing to help you stay on track this holiday season. They are absolutely delicious! These pancakes are healthy and pack some amazing flavor. Plus cooking with coconut oil always brings out awesome flavor. And let’s not forget everyone’s seasonal favorite, pumpkin spice! This recipe is SO quick and easy to make. It takes very little time to mix up a batch (or two) of this batter. Then in just a few minutes on a hot griddle, and breakfast is ready! You can customize them with all sorts of different toppings. This recipe calls for bananas and pecans, but blueberries and raspberries are also perfect, Paleo-friendly choices. Step #1: In a large mixing bowl, whisk the eggs, pumpkin puree, and honey until thoroughly combined. Step #2: In a separate bowl, combine the almond flour, coconut flour, baking powder, pumpkin pie spice, and salt. Step #3: Next, add the dry ingredients to the bowl with the egg mixture and then gently fold the two together until blended. Step #4: Heat one tablespoon coconut oil in a large griddle over medium heat. Once hot, spoon 2-3 tablespoons per pancake and cook for 3 minutes on the first side, then flip and cook for another 2-3 minutes on the other side. Repeat this process with remaining coconut oil and pancake batter. Step #5: To serve, stack 2-3 pancakes per serving and top with sliced bananas, chopped pecans, and a drizzle of maple syrup, if desired. Enjoy! Delicious homemade Blueberry Lemon Buttermilk Pancakes are always a crowd pleaser. On chilly mornings, quick and easy Instant Pot Quick Oats – Raisin, Apple, and Maple Syrup Flavored are a warm, comforting and hearty way to wake up. For the breakfast traditionalists who want something aromatic, gooey and sweet, whip up these Best Homemade Cinnamon Rolls that are sure to satisfy. 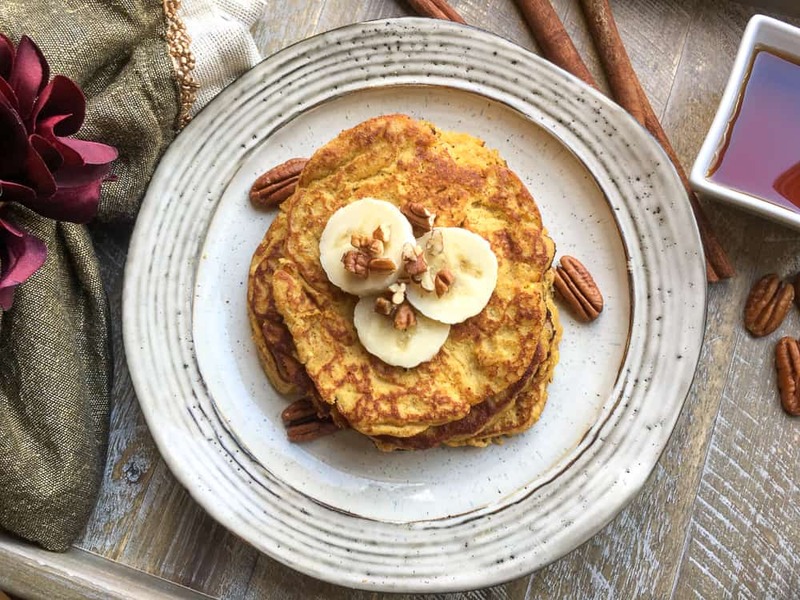 Paleo Pumpkin Spice Pancakes are just the thing to help you stay on track this holiday season! Heat one tablespoon coconut oil in a large griddle over medium heat. Once hot, spoon 2-3 tablespoons per pancake and cook for 3 minutes on the first side, then flip and cook for another 2-3 minutes on the other side. Repeat this process with remaining coconut oil and pancake batter. To serve, stack 2-3 pancakes per serving and top with sliced bananas, chopped pecans, and a drizzle of maple syrup, if desired. Enjoy!